Finding The Right Employment Lawyer For You. Why People Go To An Employment Lawyer. Most Commonly Asked Of Employment Lawyers. In normal circumstances, an employee is defined as someone who has an exclusive, long-term relationship with an employer, and an independent contractor is free to provide services to many different organizations. However, a third type of relationship has developed over time known as the intermediate employee or the intermediate worker. This is a hybrid status that has been recognized by the Canadian Courts for some workers. The term “intermediate” applies to those workers who are neither employees nor independent contractors. The courts have traditionally assessed this kind of relationship as existing when there are relatively high levels of subordination and economic dependency between the parties, as well as, evidence that the relationship has developed and is intended to be a long-term permanent one. Determining whether someone is an employee or an independent contractor is based on an assessment of dependency. People might think an intermediate employee relationship will only be found if they get 100 percent of their income from one source. That’s not necessarily so. When looking at dependency, you have to look at it in conjunction with other factors, such as the long term permanency of the relationship. In some situations where there is dependency, the worker might obtain 50 percent of their income regularly from one organization. It doesn’t have to be 100 percent of income in order for the relationship to be deemed a dependent one. There are cases in which a dependent or an intermediate worker relationship was found where the worker received 25 percent of their income from one source. You might say that 25 percent doesn’t seem to be a whole lot. The courts, on the other hand, look at it in conjunction with the fact that it was a long-term relationship and a steady income came from this one source. They also look at what the intention between the two parties was at the time that they negotiated the agreement with each other. Case Law has developed in such a way as to protect those intermediate workers, who don’t qualify as independent contractors, but who aren’t really employees either against termination without notice. 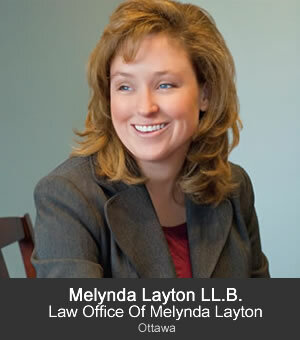 If you, or someone you care about, is dealing with employment law issues in the Ottawa, Ontario Region, contact Law Office of Melynda Layton. This article is taken from an interview on October 9, 2007 with Melynda Layton, Employment Lawyer at Law Office of Melynda Layton , an Ottawa, Ontario Employment Law Firm. Note that laws vary from province to province. Please consult with a lawyer in your own area to be sure of the laws and specific issues in your own jurisdiction.